It’s one thing to know a changeup is coming, but quite another to have the patience to let the ball travel. Learn a great way to help your hitters practice hitting the changeup. Changeups go slow, and if hitting slow pitching causes your players problems, then read on. Whether it’s advanced hitters trying to let a changeup travel, or younger hitters trying to hit “slow pitching”, patience can be tough to practice. But, thanks to Lizzy Ristano, Associate Softball Coach at the University of Notre Dame, here’s an ingenious and simple drill for helping your hitters be patient. 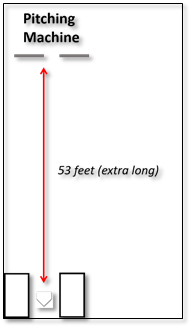 Put your pitching machine out about 10 feet beyond your normal pitching distance. Put a protective screen in front of it, and now pitch to your hitters. Don’t crank the machine up faster just because it’s farther away, keep the speed at the minimum it takes for the ball to reach homeplate. This simple, yet brilliant drill will help your players feel just what patience feels like. They’ll be forced to actually let the ball travel to them instead of lunging out toward the ball, and it will give them some great practice at hitting a changeup.